Why Is My Car Door Lock Stuck? Having your car door lock stuck is one downside to the need of having to lock your car doors to prevent vandalism and theft. There are many reasons that they may occur, not limited to being frozen, breaking, or needing a bit of loosening. Whatever the cause, it is an extremely frustrating experience if your key won't unlock car door. Having a vehicle that is not working properly when you need it is not very useful. That is why you will find several ways that you can fix your stuck lock below. If there is dirt inside the lock, extreme weather conditions may cause the lock to stop working. When the key won’t unlock your car door, the main culprit is most likely dirt. Dirt between the springs absorb water and when it gets cold enough it will freeze, casing the springs and wafers to be frozen in place. Another cause of a car door lock being stuck may be a simple need for lubrication. Using a graphite powder or W-D 40 may do the trick by removing the debris and dust from the gears and giving them a bit of lubrication to begin moving again. Is your car door lock stuck? The first thing you want to do, because it is the simplest of all the fixes is to lubricate the door lock tumblers. You can use an aerosol can or tube of graphite powder. If it is still sticking, slowly wiggle the key then add more graphite. Repeat this process if necessary. It might be a good idea to wait a few minutes after spraying the graphite to give it time to work into the crevices. This is the best method to use when your car door lock is frozen and the key won’t turn. There may be times when the key is worn or broken. Be sure that you check your key for excessively worn sections. You may need to purchase a new key. However, do not use the worn key. 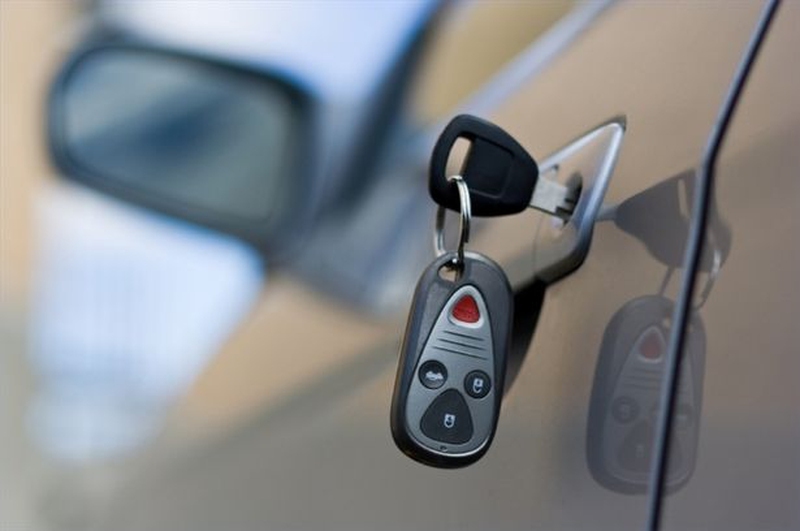 If you do not have the original, then you will need to have the dealership cut you a new key. Once you have the new key, keep it in a safe place and only use a duplicate. If neither of the above methods worked, it is time to look further inside your door for the cause. Remove the panel by ensuring that you have released all the hidden screws and clips. Search everywhere otherwise you may not be able to remove the panel, or you may even break the panel. Once you have ensured all the screws and clips are released, pry gently on the corner of the door panel. Once the panel is loose and removable, disconnect any wiring harnesses and additional mounting screws. Check the lock cylinder with a flashlight. This is attached to lock activation rods. Check to see that the rods are all secure and properly aligned. Then, check the lock assembly for any broken parts. On power door locks, the motor drives the rod that controls the lock and unlock switch. You can test your key for proper operation by unhooking the rod on the motor. If it works, you know that the door lock motor needs to be replaced. When you are locked out of your car, you may need to call a locksmith. If you are unable to get beneath the window to pop the lock, then it is time to call for help. The locksmith will use specialized tools to unlock your car. Make sure that you turn off your car alarm when your car door lock is stuck. Working on your locks will set off the alarm. You may also want to warn your neighbors about what you are doing so they do not call the police when your car alarm does go off. If you are in an unfamiliar place, it is a good idea to ensure you have your car paperwork or someone to vouch for you in case the police are called.